Another year has begun. The Tide is number 1 in the pre-season polls. Of course, that doesn't really mean much. I hope the team has another great season, but it will be extremely difficult to match last year. So, lets get "rolling" and enjoy the year. Not much to say about this one. They did what was expected and crushed inferior opposition. That was a heck of a catch by Jones. Backups QB McCarron and RB's Lacy and Goode did well. RB Richardson was excellent running and receiving. I hope Mark Ingram is healing and will return soon. Next week is an early big test, the Nittany Lions (#18) are coming. A good early win over a ranked opponent. It was great to see the Tide playing football again. Several key players did not play or played very little. The offense looked somewhat better than last year, running more complex plays. The defense seemed at times to be a little lax in the pass coverage and in pursuit to the outside. But, they only allowed 3 points. They also forced key turnovers , stopping Penn St. drives. All in all, a good win. Next week is a weak opponent so hopefully they will win without too much trouble. Not much to say again. They played a much lesser team. Mark Ingram played for the first time this season. The Tide is traveling to Arkansas (#10) next week to face the Razorbacks. The SEC schedule now begins. Roll Tide! That was close! Early mistakes had them down by 10 at the half. The Tide had to rally in the 4th quarter to get the win. The defensive adjustments at halftime stopped the big gains through the air. The two interceptions late in the game proved decisive. Poor throws by the Razorbacks' QB helped. 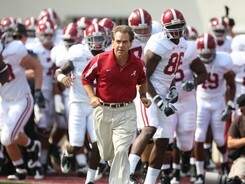 It was good to see Alabama stay with the running game to score the winning TD. Arkansas is a good team and should win many more games. No break in the SEC, next week the Gators (#7) are coming. A great effort on offense and defense. The Gator offense was effectively disrupted all game. The defense is beginning to look like a championship caliber defense. The offense is becoming very versatile, running many different looks. A great win for the Tide. Next week they travel to visit the Gamecocks (#20). The third ranked team in a row. Roll Tide! They finally lost. Give credit to the Gamecocks, especially their offense. Those long drives, and converting on 3rd and long, killed the Tide. I thought they may have a chance to win after the interception, but Alabama abandoned the running game on 2nd and 4 in the Red Zone. Many of the Carolina QB sacks were caused by not throwing the ball away. They will have to play much better than they did today to have any chance of making the SEC title game. Many strong teams ( Auburn, LSU ) are still on the schedule. Next week the Rebels come calling. This was the Tide's first regular season loss in over two years. That's pretty darn good. Let's see how they respond to losing. Roll Tide! They responded to the loss well. The offense was somewhat out of sync, but the Rebel defense was pretty good. The Tide defense kept the Rebels off balance most of the game. A conference win always helps. They still have a lot of work to do if they want to win the SEC. Our cousins down on the plains are looking like they have ideas of their own. The Tide travels to Knoxville next. Should be a tough one, always is. The BCS rankings have just been released. Six SEC teams are in the Top 25, and three in the Top 10. Alabama is ranked #8. A really great second half. The Vols played well at first but they were no match for the Tide. Wide receiver Jones made some great catches and set an Alabama record for receiving yards. The QB got hit a lot early, but the O line improved in the second half. I still have concerns about the defensive secondary. They have trouble staying with receivers sometimes. I saw our cousins play today. They look very good. The Tide travels to the Bayou in two weeks. A seismic shift in the BCS. Our cousins are now ranked #1. The Tide is #7. 10/31/10-- The Tide rose to #6 in the BCS. Our cousins fell to #2 even though they won. Well, no time to think about all that ranking stuff right now. On the road to visit the #10 LSU Tigers next Saturday. I hope the bye week was helpful. They were outplayed in the second half. The secondary weakness showed up again on the long TD, and the 3rd down completion in the 4th Qtr. The offense was impressive in the final TD drive to pull within 3. There were some critical penalties and lack of execution at times. It has become clear that the lack of a consistent running game is having its effect. The chance of making the SEC title game is now almost gone, and the showdown with Auburn (#2) looms on the horizon. But, there are two more games first. Mississippi State (#19) is next. Roll Tide! The better team won easily. State had no answer for the NFL bound skill players (Ingram, Jones, Maze). State's offense was dismal and team speed was lacking. I liked it when Coach Saban chewed out the back-up QB for making a dumb decision. Next week should not be much of a challenge. They just need to stay focused and not look ahead to the 26th. At least no one was injured as far as I can tell. Well, here we are, one week away from THE GAME. This promises to be a classic. I believe they can score a lot on the Tigers. The question is whether they can shut down the Auburn QB. They did it to Tebow last year, but that defense was better. The secondary needs to play its best game and the LB's have to limit the yards their QB gets running. Against the Auburn offense, the Tide must keep up and can't do many 3 and outs. They must get points, especially TD's when in the Red Zone. Turnovers could spell disaster, especially if they give the Tigers a short field. Playing at home does help, but I just hope Alabama plays their best and does not self-destruct. Just thinking about the game has got my heart pumping. I better go take my blood pressure pills. ROLL TIDE! What a disappointing loss. They had a 24 point lead and then the offense went into a funk. It's been the same story in several games this year. Is it because they don't adjust well when the other team does? The running game didn't show up again. Too many 3 and outs in the 2nd half, 2 fumbles in the Red Zone, and a dropped TD pass. A lack of execution, and Auburn is too good to make mistakes like that. I hope the QB is alright and can play in the bowl game. Well, it's been a good year regardless, and I wish Auburn (#2 BCS) well. I will be rooting for them to bring home the 5th straight National Championship trophy to the SEC. Another year has come to a close. I wonder what bowl game they will get. Nebraska maybe? That would be interesting. ROLL TIDE! The Tide will play in the Capital One Bowl against Michigan State on Jan. 1. This sounds like an interesting match-up. I have seen MS play a few times this year and they are a good team. Their passing attack may cause Alabama some trouble. I can hardly wait. Roll Tide! A very impressive victory. State had no answer for the Tide's pass rush. They didn't let up this time. The offense ran and passed equally well. It was a great end to a good year. There will be a lot of returning starters next year, so I've hopes of another winning season. The only bad part is having to wait till next Autumn to see them play again. They may finish in the top 10 of the BCS because of this win. By the way, the SEC really ate the Big Ten's lunch today. 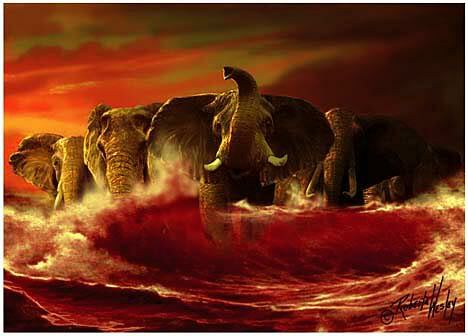 That avalanche is also called, "The Crimson Tide!" A very good year and a lot of fun to watch.